NOTE: The 2 CDs in Vol. 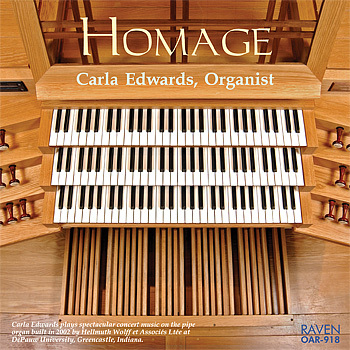 6 (OAR-740) are contained within the 11-CD set of the Complete Organ Works of Bach, Raven OAR-875, and are no longer available as a separate Vol. 6. Project Completed This sixth volume completes George Ritchie's series of recordings which comprise all of the works for organ by J. S. Bach. Together, the recordings survey ten organs which have been built in America by artisans who work in a style based on historical precedents. Each volume includes registrations of the works recorded, stoplists and descriptions of the organs, and musicological notes on the works by George Stauffer and George Ritchie. Five of the six volumes contain two CDs each, and are offered at the price of a single CD. Two Organs: Martin Pasi built the three-manual organ for Saint Cecilia Cathedral in Omaha, Nebraska in 2003 as his firm's Opus 14. The organ features dual temperaments: one well-tempered and the other 1/4-comma meantone (George Ritchie uses the meantone temperament for the Prelude and Fugue in C Major). The 78 ranks include two at 32' pitch. Charles Fisk (1925-1983) built his largest instrument in 1979 for the House of Hope Presbyterian Church in St. Paul, Minnesota. Like the Pasi organ, the Fisk was built to play a wide range of historical literature. The Great and Brustwerk divisions follow North German Baroque models located in the cities of Hamburg and Lübeck. Some characteristics derive from the work of Andreas and Gottfried Silbermann, blending German and French ideas of the 18th century. Fisk has incorporated stops in the style of 19th-century organs by Aristide Cavaillé-Coll. The organ has four manuals and 86 ranks, two of which are at 32' pitch. Paul Aldridge reviews in the January, 2006, The American Organist: "Everything about this production exhibits the highest quality. When the need is to hear Bach played to perfection, this set should be at hand. Impossible to recommend highly enough!"